Former President Barack Obama is back on the campaign trail two weeks before the midterm elections, appearing Monday at a rally at the University of Nevada Las Vegas campus to boost Democrats up and down the ballot. “The consequences of you staying home would be profoundly dangerous for our country, for this democracy,” Obama said. He's particularly focused on Nevada's Senate race, one of the tightest in the country. Democratic Rep. Jacky Rosen is challenging Republican incumbent Dean Heller, the only Republican senator up for re-election in a state that Hillary Clinton won in 2016. Heller has been endorsed by President Trump, who just on Saturday stumped for him in Elko, Nevada, on the same night that Obama's vice president, Joe Biden, campaigned in the state for Rosen. 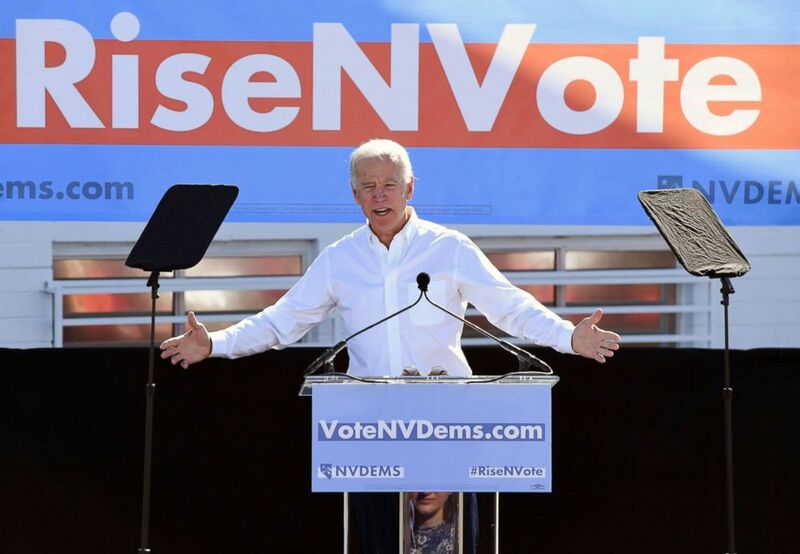 Joe Biden speaks during a rally at the Culinary Workers Union Hall Local 226 as he campaigns for Nevada Democratic candidates, Oct. 20, 2018, in Las Vegas. Obama held nothing back in his disdain for the policies of President Trump and congressional Republicans. "There is only one real check on abuses of power, one real check on bad policy, it's you and your vote," Obama said to a crowd of 2,000 supporters. Speakers hit hard on the need for high voter turnout throughout the day and advertised that early voting was underway in Nevada. Nevada Democratic Party chair William McCurdy started a chant saying "You vote, we win." Obama made the case that his administration had put the country on a track that's led to the powerful economy that President Trump takes credit for. He touted the ongoing longest streak of job growth on record, providing health care for millions of Americans, and cutting deficits during his administration. Obama picked apart a number of current Republican positions including claims by Republican congressional candidates that people with pre-existing conditions would not lose their health insurance. "I know you can bet on anything here in Vegas, but you don't want to bet that Republicans are going to protect your healthcare." 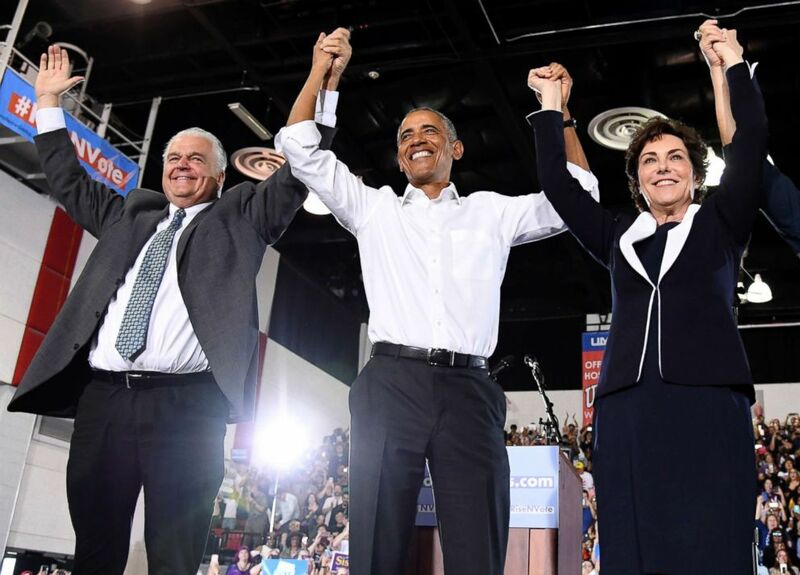 Clark County Commission Chairman and Democratic gubernatorial candidate Steve Sisolak, former President Barack Obama and U.S. Senate candidate Jacky Rosen at a get-out-the-vote rally at the Cox Pavilion, Oct. 22, 2018, in Las Vegas. Without mentioning him by name, Obama took a thinly-veiled swipe at President Trump. "Unlike some, I actually try to state facts—I believe in facts- I believe in a fact-based reality, a fact-based politics," he said. "I don’t believe in just making stuff up. I think you should say what’s true." In her Senate campaign, Rosen has made health care the primary issue of her campaign -- an issue that was also central to Obama's presidency. One of her supporters, Malerie Stanley, who arrived more than three hours before the rally to ensure she would get inside, said women's rights was the key issue for her in the midterms. Another issue at the top of voters’ minds was health care. Randi Ghrist, a mother of three, worries that her children will be able to get healthcare. Many voters said above any individual issue, ensuring a check on President Trump was what would drive them to the polls. Obama is the latest in a string of national surrogates who have visited Nevada in the 2018 midterm cycle and Democrats are hoping some Hollywood star power will invigorate their base. Obama was joined at the rally by "Ugly Betty" actress America Ferrera, and the hip-hop group Salt-N-Pepa. Steve Sisolak, the Democratic candidate for governor, also appeared at the rally. Sisolak, who's currently the Commission Chairman of Clark County, the county that encompasses Las Vegas, faces Republican candidate Adam Laxalt, the state's attorney general. It's an open seat race for the seat currently held by Republican Gov. Brian Sandoval, who has reached the end of his term.